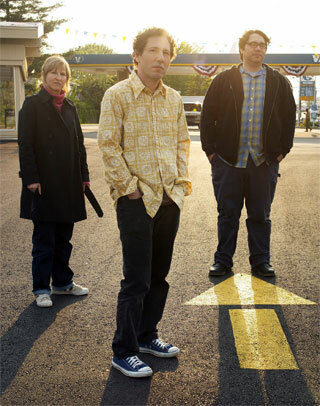 Yo La Tengo are one of those bands that have always made me feel suspicious. That famous Onion story from some years ago1 “37 Record-Store Clerks Feared Dead In Yo La Tengo Concert Disaster” absolutely nailed it for me. There’s the whole indie schmindie aesthetic that made me want to run away screaming “Hair clips! Ribbons! Aaaargh!”. I did once venture out into Tengoland and got “And Nothing Turned Itself Inside Out”, but “You Can Have It All” aside, it didn’t really make much of an impression. But last year, I thought I’d give “Popular Songs” a try. It’d had good reviews, some stating that this was probably their most complete album ever, and the omens were good. And you know what? It’s really good. Didn’t manage to listen to it enough to be able to call it an album of the year, but I’m listening to it more and more and finding new depths. The sheer variety – from Sonic Youth-esque 12 minute guitar freakouts to dream-pop to bossa-nova to indie-schmindie Belle And Sebastian songs (but done exquisitely well) – makes for a great album. And this morning, after listening to the new Yeasayer album (see tomorrow’s post, if you’re a time traveller), I needed something a bit more pleasant to listen to. What came up? Yo La Tengo. So there you go; if a newish band comes squawking out of New York with music they hope is new and shiny (but ends up coming across as plain irritating – you can see where I’m going to with this), then listen to an old New York1 band to salve the pain. I can safely say I’m through my Tengophobia. I’m now going to start going back through their catalogue, starting with the aforementioned “And Nothing Turned Itself Inside Out”, freshly copied to my new iPhone. Any suggestions? 1 Ok, Hoboken. You can see New York from there.